4 October 2018. Brussels. 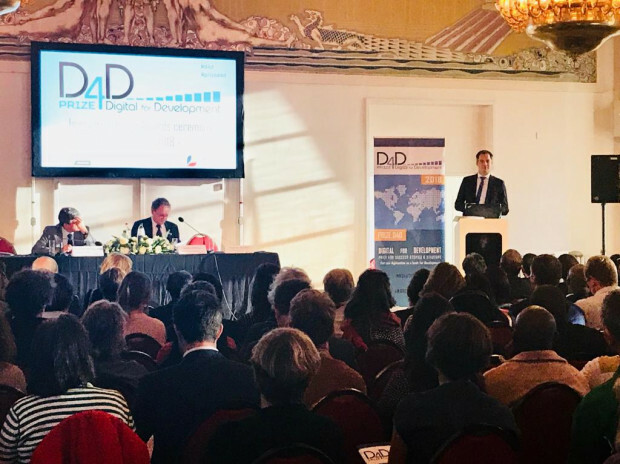 During the official ceremony Paul Van Mele and Jonas Wanvoeke received the ‘Prize Digital for Development (D4D)’ award on behalf of Access Agriculture from Alexander De Croo, Deputy Prime Minister and Belgian Minister of Development Cooperation and Digital Agenda. 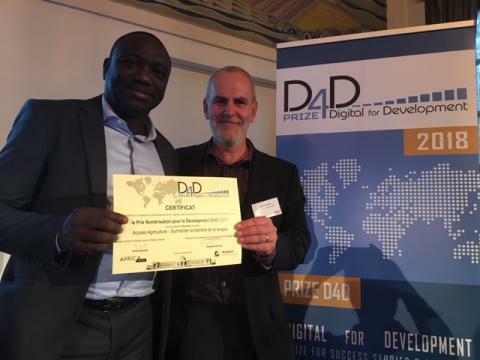 After presenting its innovative approach, products and services to a jury comprising 20 major actors main development players in Belgium, Access Agriculture was selected as the winner of ‘iStandOut’ category at the biannual Prize Digital for Development (D4D). Prize D4D rewards outstanding initiatives that use digitisation and new technologies as a lever for development towards achieving the Sustainable Development Goals (SDGs). that will be officially launched in January 2019 to support local entrepreneurs in the South to start a business around last mile delivery of farmer training videos. The jury congratulated Access Agriculture on how effective its innovative approach and outstanding outreach has been. Rather than developing documentary videos for donors, Access Agriculture has encouraged the production, translation, distribution and use of farmer-to-farmer training videos to allow others across the South to learn from those few farmers who were fortunate to receive hands-on training. Many farmers in developing countries can’t speak English, French or Spanish. Access Agriculture has trained local partners to translate videos into their own language. The step by step videos feature inspirational, empowered farmers providing practical advice in a format that others can easily learn from and experiment with sustainable agricultural technologies, natural resource management and food processing. The Access Agriculture video platform (www.accessagriculture.org) hosts nearly 200 videos in 75 languages, all freely downloadable. Local language videos are distributed by development organisations, extension services, TV and rural radio stations, and farmer organisations on micro SD cards, DVDs, preloaded phones, tablets, USB sticks and smart projectors. 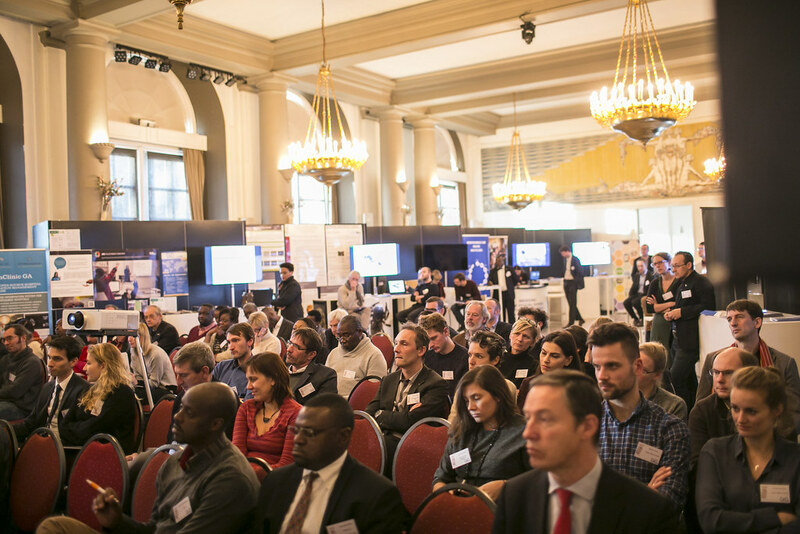 Prize D4D is a biennial initiative of the Belgian Directorate-General for Development Cooperation (DGD) in collaboration with the Royal Museum of Central Africa (RMCA). 1 October 2018. Access Agriculture released two new videos on aflatoxins in maize. These videos are currently available in English and French. They are freely downloadable, also in 3gp format for mobile phone viewing. The translation in a number of African languages are planned in the near future. Please, kindly share the new videos with as many people as possible, using the various social media and email options provided at the right side of the screen on the website. Maize that is poorly dried and stored will develop moulds. These moulds produce poisons, called aflatoxins. Some moulds that live in the soil can infest your crop when it suffers from drought. They can secrete deadly poisons, called aflatoxins.